Don't let the garish display of Christmas-like lights deter you--Casa Calamari is a good spot for some hearty Italian fare, perfect for a cold winter's night (as it was last Friday). 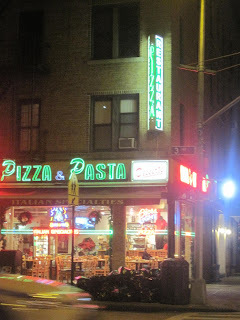 That's where Kel & I ended up the other night, and it was well worth the 5 minute walk in the whipping winter winds. 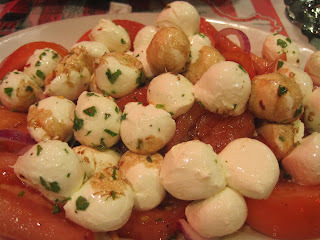 We got one of our favorite salads: the mozzarella and tomato. It came out ASAP, and it was delicious. It had the softest, most flavorful bites of mozz, tossed in herbs and coated with just the lightest layer of olive oil and balsamic. YUM. For once, Kel enjoyed the tomatoes more than I did, but overall we both loved this dish. 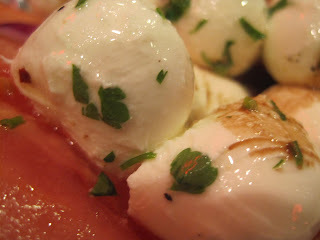 I could have eaten these mozz bites all day! We took home the leftovers and noshed on them for a few more days--they just got even better. Soooooo good. 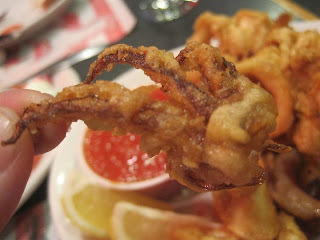 Kel is not a real seafood fan, but she does enjoy calamari, so we shared an appetizer. This has to be one of the biggest plates o' calamar' (as they say in Brooklyn, yo) I've ever seen. It came out after we got the salad...so maybe I just wasn't as hungry, but I only ate 4 or 5 pieces. I love the little tentacles, and Kel is absolutely skeeved by them, so I enjoyed those happily while she stuck to the rings. It was just good, not great. 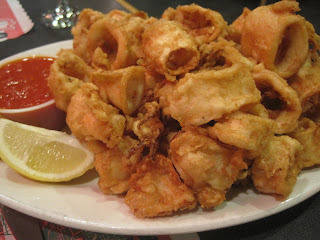 I guess I expected a little more considering their NAME has "calamari" in it. We ate a little bit of this and then wrapped it up to go, but I did not go back for more of this once we took it home. 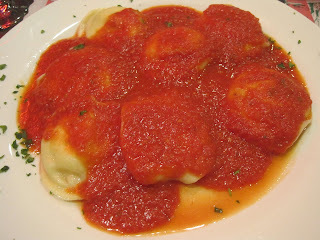 For my entrée, I ordered their ravioli. You get 7 or 8 ravioli for about 9 bucks. Normally I would say "Hey, I can buy a whole bag for 2 bucks and enjoy these at home," but I just really really wanted something soft, cheesy, and soul-warming. 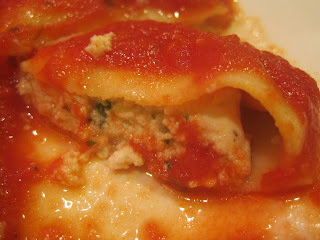 These ravioli were just the thing. They were perfectly cooked, decently filled but not overstuffed, and the sauce had this strong but sweet garlic flavor to it. Yum. This sauce was great. Simple, super smooth, and garlicky without being overpowering. Absolutely worth it. 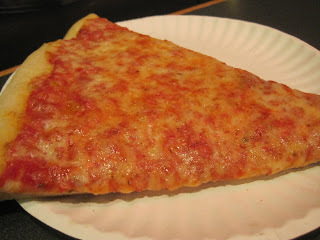 Kel grabbed pizza for her entree--just your basic plain cheese slice. 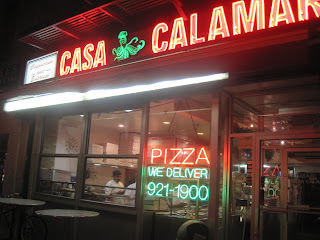 I didn't try hers, but I can tell you that if you're ever wandering past Casa Calamari on 3rd Avenue, stop at their walk-up window (posted below, with tables outside for standing and eating) and get a slice of their square, thin-crust pieces. Holy Moley, you'll swear you're back in Napoli (where I've had some of the best pizza EVER). A great buy at this place? 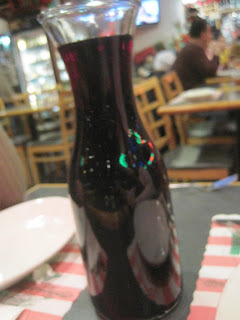 Their carafe of house red wine is a mere 17 dollars--not much more than the cost of a single glass at many Manhattan eateries. 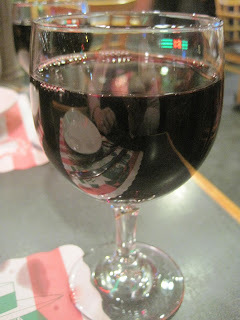 It was more than enough for the two of us as we toasted the beginning of a new Year, which got off to a bit of a rough start for us both. We still remain hopeful, because with family and friends supporting you, you're already on your way.